I love Asian inspired meals and this one is great for a quick and easy meal when you have absolutely no time! Sweet and Sour Chicken on top of Basmati rice, so delicious you gotta try! 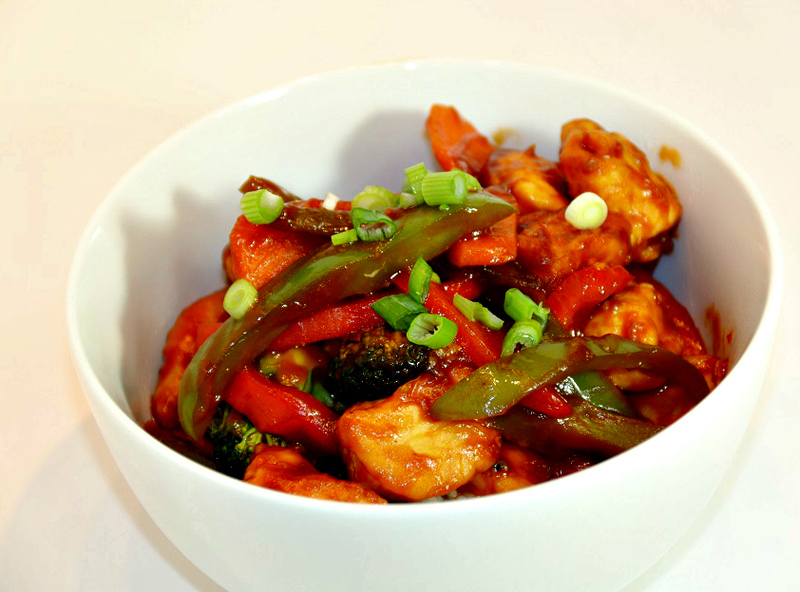 In this recipe I tired to make a healthier option to the deep fried sweet and sour chicken by lightly flouring chicken and sauteing chicken in a small amount of oil, and only cooking my veggies a little so they remained a tad crisp. Quick and easy asian inspired chicken dish. Start off by preparing your vegetables. Peel and thinly slice carrots on the bias, slice all bell peppers (red and green) into thin strips, chop your broccoli into florets and rinse bean sprouts. Set aside for later. Heat oil in a skillet for cooking chicken. Prepare chicken by chopping into bite sized pieces, season with salt and pepper, then toss into flour for coating. Add chicken to your skillet (make sure oil is sizzling). In a sauce pan combine sugar, ketchup, rice wine vinegar, garlic, soya sauce. Simmer for 5 minutes low-medium heat. Remove chicken from skillet when finished cooking and set aside, add your vegetables to lightly saute for 5-8 minutes depending on how cooked you like your vegetables. I like mine with a little crunch! Cook on medium heat. Add chicken and sauce to the vegetable skillet, stir till all chicken and vegetables are coated. Serve over rice. I added a bit of water to thin down the sauce, once sauce is heated it gets very sticky. This entry was posted in Main Dishes, Recipes and tagged Asian Cuisine, chicken, main dish, sweet and sour chicken.